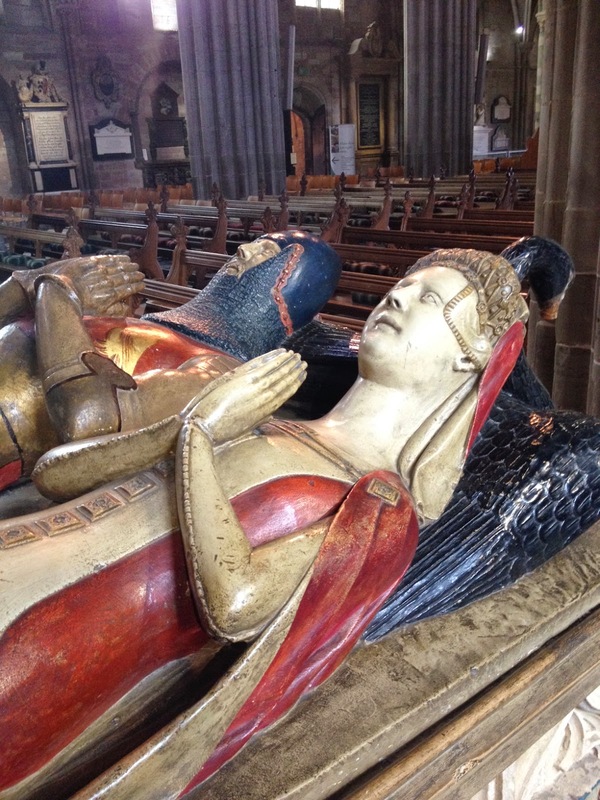 If you wander around Worcester Cathedral you are bound to come across the interesting effigies of a Knight and his lady in the north aisle, near the porch door. 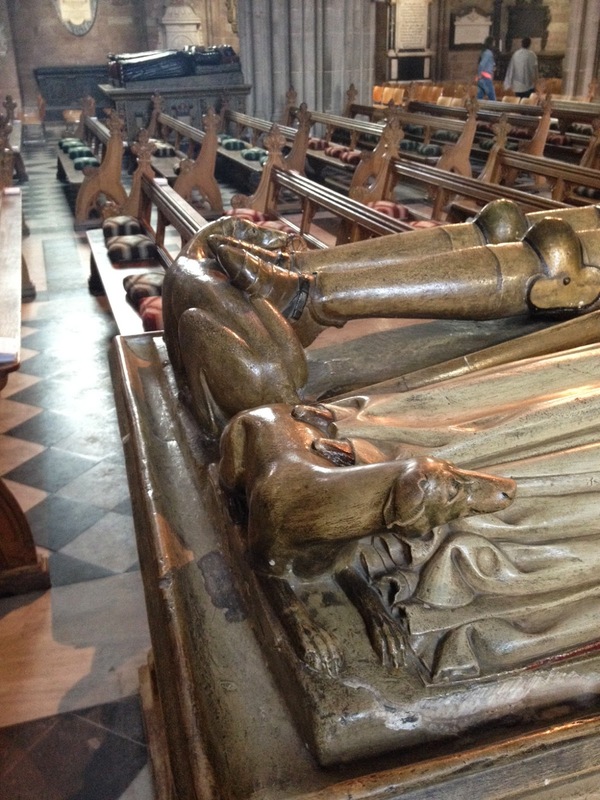 If you go and look at the tomb, you will notice the arms of the Beauchamps – Earls of Warwick, and Beauchamps, Barons of Powick. 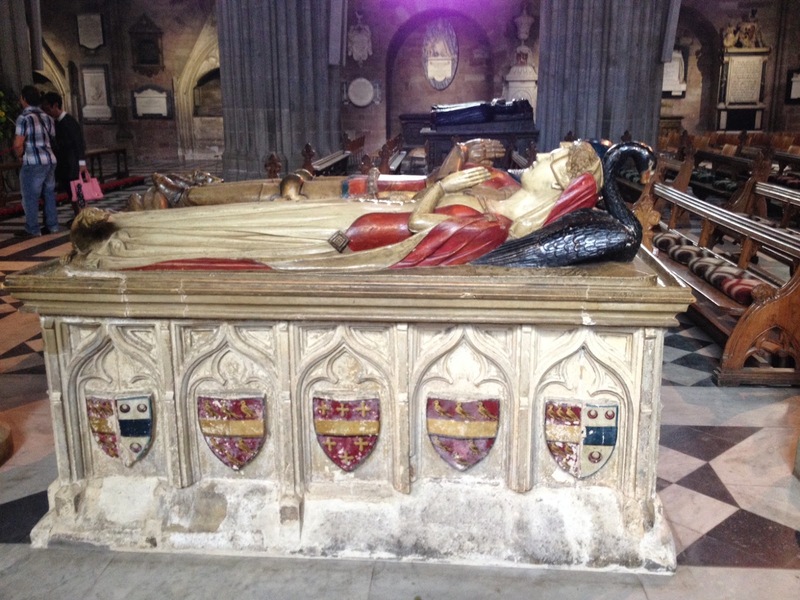 There has been much dispute about whether the effigies are of Sir John Beauchamp of Holt and his wife Joan, or Sir John Beauchamp of Powick and his wife Elizabeth. Sir John Beauchamp of Holt rose rapidly in the favour of Richard II. He served in the wars in France, and received the honour of knighthood for his service in the wars against the Scotch. In 1377 he became Steward of the King’s household, and on October 10th of the same year was by patent (being the first instance of the kind) created Lord de Beauchamp, Baron of Kidderminster. However, he did not enjoy these honours long - he was seized by the King for having appeared in arms in London together with other Lords “for treasonable purposes” – and after confinement at Dover he was beheaded on Tower Hill aged 58. It was said that the monks at Worcester Cathedral, being ancient friends of his family, received his body into their Cathedral, in which it was interred, and his tomb was erected over his grave. 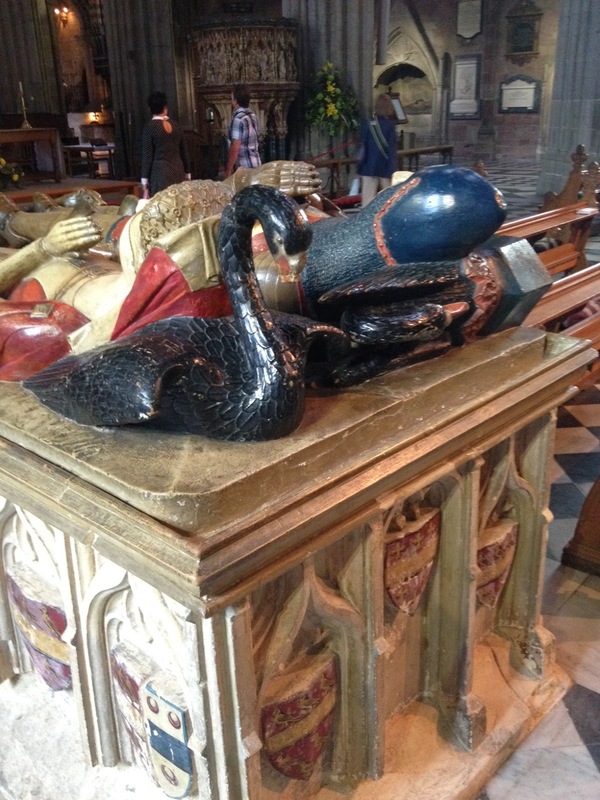 If you believe that the tomb belongs to Sir John Beauchamp of Holt, you may attribute the relevance of the swans that the couple rest their heads on to the crest of the Atwoods of Wolverly, the last of whom John Beauchamp of Holt was declared to be heir. One of the Atwoods who had gone to the Crusades, had been so long absent that his wife was about to remarry. But, before she did, her milk-maid, guided by a dog, found a man who was emaciated, unkempt, and had iron shackles around his limbs lying asleep on the grass in a meadow. Despite the haggard appearance of the man, the dog seemed to know him and greeted him as a friend. The maid fetched her mistress, and when the man greeted her, he claimed that she was his wife. The Knight told the tale of how he has been taken prisoner and kept in a dungeon. One night when he was praying for deliverance an angel came and spoke words of comfort; then he lost consciousness, and when he awoke he found himself in the meadow. The knight had a vague memory of moving through space; but being too humble of heart to imagine that an angel had been sent to carry him, he declared a swan had brought him, for he had perceived feathers around him. For this reason, he took a swan for his crest, and the dog which recognised him was carved in marble at the feet of his effigy. However, many people are very cynical of this story. On many sculpted tombs a helm of some sort was needed as a support for the Knight’s head, it could be argued that the swans were only there as a support, not to represent the legend of the Atwood family. The animals are also thought to have represented the Knight’s tourneying triumphs, or as recognition of military achievements which was very common in effigies. It has also been questioned that if Sir John Beauchamp of Holt was beheaded, why would a grand tomb be erected in his honour? Furthermore, it has been recorded by W.M. Thomas in 1737 that in the nave there is a monumental slab minus its brass of a man of armour, which he attributed to Sir John Beauchamp of Holt (which is now lost). This must surely mean the tomb is more likely to represent John Beauchamp of Powick and his wife Elizabeth. We are a local Disaster Restoration Company that provides emergency services for Residential and Commercial Properties in the Sarasota and Manatee county areas. Key Cities are Bradenton, Sarasota, Palmetto, Venice, Lakewood Ranch, and Osprey. We are Mold, Water, Odor, Cleaning Specialist. Detail Cleaning Company. for more information visit my website https://docs.google.com/forms/d/e/1FAIpQLSdqqTnKDTrwr_Vm6YC-MH9bkFff_h5wLJuKKYZ8QYtO25Tv-Q/viewform?usp=sf_link.